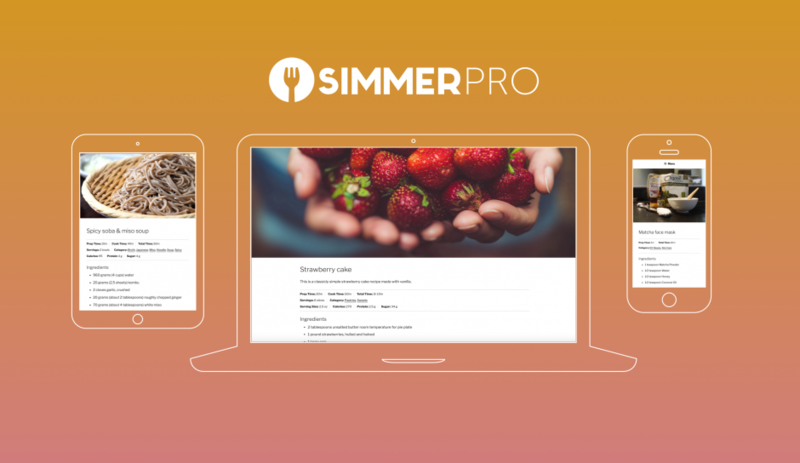 Simmer Pro 0.7 is the first version ready for production on any WordPress self-hosted environment, following the release of Simmer Pro 0.5 Beta. It adds nutrition content including Calories, grams of sugar and protein for individual servings in recipes and other enhancements in future versions. This plugin is only accessible to customers with an active Small, Medium, or Unlimited Simmer membership in the Account > Downloads section on this website. If you have questions about this plugin or would like personalized information about how this software can add value to your recipes, contact customer service. This plugin is ready for use in production by any web or mobile app and will conclude beta with Simmer Pro 1.0 in November 2016. We appreciate any feedback our customers can share about developing with this plugin, especially when using the Google Structured Data Testing Tool. 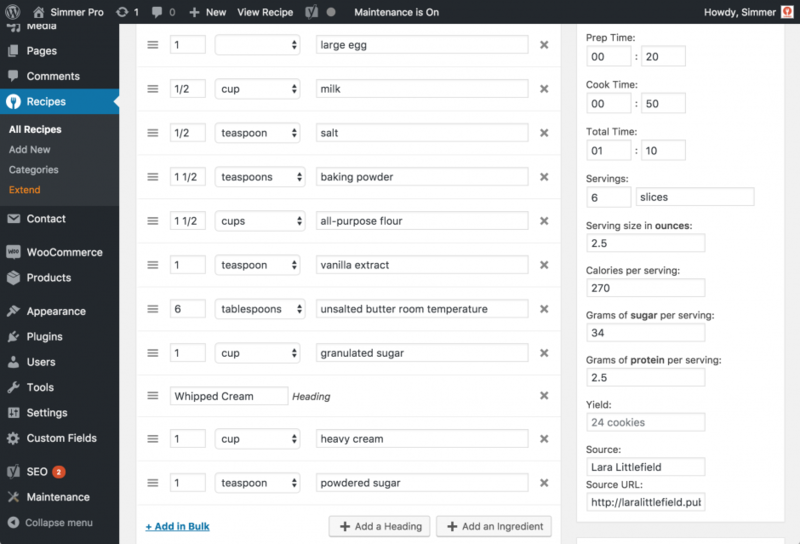 To upgrade from the open source version of this plugin to Simmer Pro, adding nutrition information to existing recipes, first, navigate to Settings > Simmer in your WordPress dashboard. Then, select the Advanced tab at the beginning of the screen. Under Uninstall Settings choose the “Keep all data” input and then click the Save Changes button. To remove the old Simmer plugin from your WordPress website, navigate to Plugins in your WordPress dashboard and find the previous recipes plugin, clicking deactivate. To complete the removal process, delete the files by clicking Delete after deactivation. To install the new version of Simmer Pro, first, download Simmer Pro from the Downloads section in your Simmer Account. Then, go to WordPress and navigate to Plugins > Add New in the dashboard. Then click the “Upload Plugin” button at the top of the screen. Click the button to choose and select the .zip file previously downloaded and click Install Now. 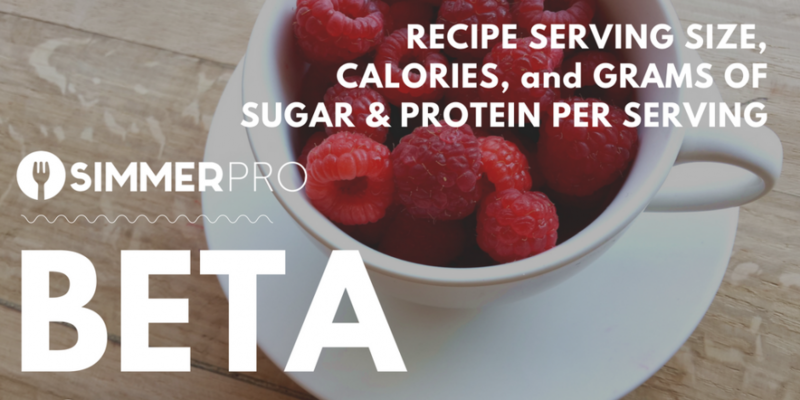 After installation, click the Activate button next to the Simmer Pro plugin to automatically load your recipes into the new Simmer Pro interface with inputs for nutrition information. This plugin is in active development and any customer with a current membership can request GitHub read access for the private repo where engineering and enhancements occur. GitHub is an excellent resource for new feature roadmaps, but we encourage all customers to share their experiences developing with this plugin with customer service and support directly for personalized service and feedback. Our engineers can help any WordPress owner quickly diagnose potential issues with any part of their system. Check our blog often for new members only releases and the complete documentation for Simmer Pro 1.0. 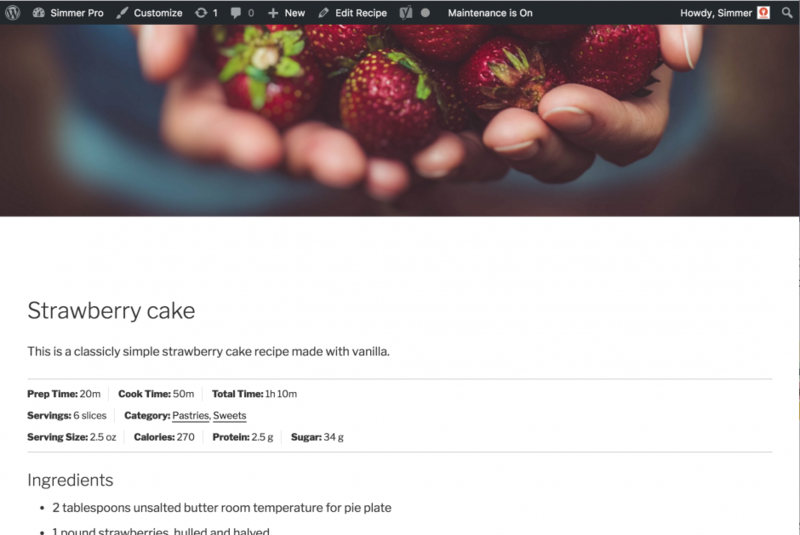 In this version instructions for aggregate or editor star ratings of recipes are included for any WordPress theme in addition to other abstract Google Structured Data strategy any WordPress owner can apply. Not yet ready to upgrade and purchase a membership with Simmer Pro? Contact sales to discuss how our software can add immediate value to your project.